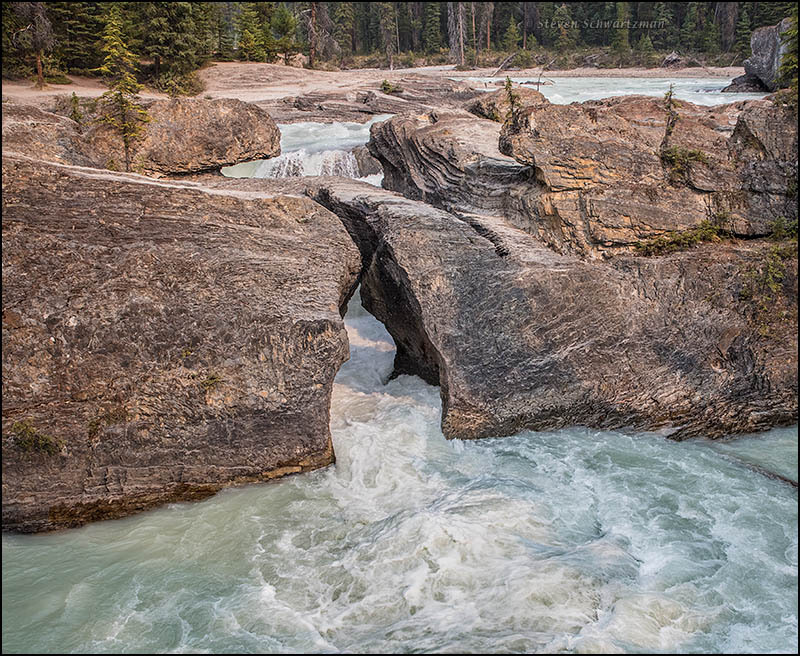 A year ago today we stopped briefly for a second look at Natural Bridge on the Kicking Horse River in British Columbia’s Yoho National Park. 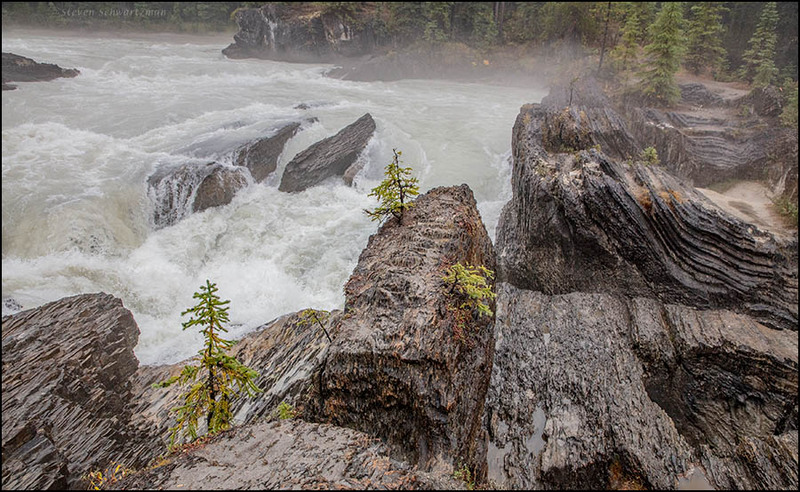 The picture below shows the churning river as it flows downstream (toward you) from the falls. Those are some mighty rapid and churning waters. I’d hate to take a fall anywhere in those photos! The second image almost looks as if the water is moving downstream – away from us. This feeling of water moving opposite of what I think I am seeing happens to me a lot, not just in the mountains, but even here when I hike to the river. I think it has more to do with the landscape and what my brain perceives to be the direction of water flow. I really love the Native American names for areas and points of interest. “Kicking Horse” sounds wild and rebellious to me! I’ll grant you, Kicking Horse sounds like an English translation of the native name for the river. In spite of the similarity to some native names, this one was actually in English from the beginning. 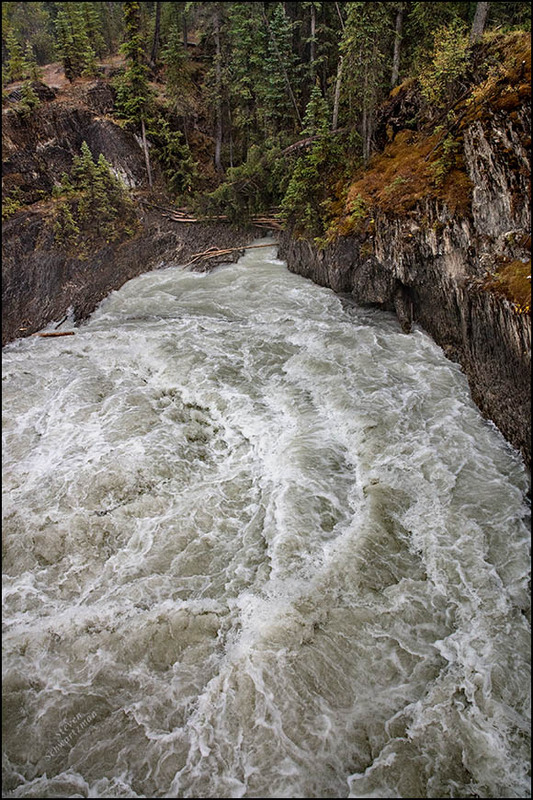 Here’s what Wikipedia says: “The river was named in 1858, when James Hector, a member of the Palliser Expedition, reported being kicked by his packhorse while exploring the river. Hector named the river and the associated pass as a result of the incident.” So in this case it was the horse that was rebellious, not the namer of the river. The second picture does indeed give the impression that the water is flowing away from the viewer. I wasn’t initially sure myself, so I looked at my other photographs and found one with a broader view that confirmed the direction in which the water was flowing. Then in the text of this post I added the words “toward you” to make the direction clear. That’s interesting about the name. I just made an assumption, since many names like that have Native American origins. Can we nickname you, just for today, Dances with Assumptions? Ha ha ha! I love that! Yes, though after you read my post today you might think of an even better name! I’ll see what you come up with! You mean like Dances with Chainsaws? Or we could say you’ve become an honorary member of the Nez Frappé tribe. Ha ha ha! I knew you’d come up with something clever! None of the old saws seemed sharp enough so I came up with a couple of new ones. We deal with our occasional flash flooding down here in central Texas, as is happening in some places today, but they really know about churning water up there in the Canadian Rockies, and they have great rock formations to go with the turbulent water. They sure do up there. Here, just now, our creek is running nicely, gurgling over the rocks. Wonderful sight and sound. I couldn’t resist and went out in the rain to take videos. Understandably, like you did the other day—though presumably better dressed this time. Well, I guess we’ve covered that topic. Yes, I used the word intentionally. Wonderful post Steve and I was so interested in this because we have or had a natural bridge in Central Otago too – it was used in Maori pre-settler days and then by the settlers once they were shown the location by Maori. Your post prompted me to do an online search, not with much hope because years ago I tried to find out about this feature and couldn’t find much at all. But a great blog-post was done in 2014, if you’re interested its at: http://www.mikepole.com/2014/05/07/discovering-the-bridge-of-stone-the-ancient-route-over-the-kawarau-river-new-zealand/ Thanks for your lovely post and I’m excited to have found out more about our own natural bridge! I’m glad this post prompted you to search for more information about your Otago counterpart, and even more, that you found what you were after. Let’s hope you visit the site now. We could say that this post was a natural bridge to Otago’s natural bridge. Let’s hope the site’s not too dangerous for you to visit. And then you can do a post about your visit. Looking forward to it. Very nice natural bridge.We have a natural dam at the Wahconah Falls not far from here. I looked back through your Wahconah Falls pictures and found a “cathedral” but didn’t notice a natural bridge. Did I miss it, or haven’t you shown it? It’s a natural dam but I but I did not label it as such. Here it is seen after a hurricane with the water passing over the top in a crease. Ah, now I see it. It’s nice how you got two waterfalls diagonally aligned. That churning stream flowing toward the viewer is wonderful! Makes me wonder where you were standing? How close to the rushing water, and what you were standing on? As much as it would be fun to say I was hanging from a tree branch or leaning out from the gondola of a balloon, the truth is more mundane. I don’t remember the specifics but I think it must have been a footbridge over the river. Footbridges were common at rugged sites like this one so people could continue along paths to other scenic places. I hadn’t thought about the possibility that viewers might wonder where I was standing. I can see now how that implicit question would make the picture more adventuresome. Glad you enjoyed it. The rocks are beautiful, the water flow is impressive, and the combination of the two must have been memorable, to say the least. But I’m most taken with those little trees in the first and last photos. They look like bonsai, and they’re the perfect, delicate accent to all that heft and force. What a wonderful place that must have been to visit; I’m glad to see it through your photos. Those smaller trees growing out of the rocks show once again how tenacious life can be. Natural Bridge is indeed a great place to visit, which meant that hundreds of other people had the same idea. As at other sites, I had to work to get views with no tourists in them. The bridge is only bridgeable on occasion! Does the water sometimes rise high enough to cover the bridge? Did I misinterpret your photos again? I thought they showed the same bridge, once under water, once clear. The first picture included the waterfall and some rock formations but not the natural bridge. That’s why I added the third photograph. My bad, Steve. I thought it might show the bridge unter water! Well, without a lot of context, multiple interpretations are possible. Psychologist Daniel Kahneman says that the mind is very good at inventing possible explanations. I think we always try to make sense of what we see or hear. We do. That can be positive, allowing us to quickly figure out what’s likely to be happening. Formulating a quick conjecture can also be negative, as the mind is tempted to draw a conclusion based on personal preferences but not enough evidence. The latter is obvious in politics. That looks like a powerful river! I remember sketching along a river in California many years ago. Sitting on the boulders next to it, you could feel as well as hear all that water roaring past. Kinda scary, really. You’re right about the power of this river, which did indeed roar through the falls and under the natural bridge. Hard to believe it’s been 13 months since we were there—and a lot longer than that for you since you sketched in California. Yes. Isn’t it interesting, though, how fresh a memory can be? I’ve been reading a little about memory lately. The current scientific understanding seems to be that we re-create a memory each time we call it up, as opposed to tapping something stored in an immutable state. Oh, I like that. So a favorite memory can be kept fresh by revisiting it, and less fun ones can be ignored into oblivion. Yes, but there’s a potential and sometimes actual downside: people have been prompted, nay manipulated, into “remembering” things that never happened. Do you recall the so-called satanic ritual abuse delusion of the 1980s?